We admit it: we have no idea who you are. We know you were a W-Drone with the OMB and IRS, but we lost track of you in the private sector. Honestly, we weren’t hanging on your every word in the Bush administration, either. One thing we do know, this brand is almost awesome! So close you could reavh out and smack it! Positives: It has both strength and motion and is informed by past campaign design which makes it instantly trendy. The colors are balanced, compliment each other nicely and lend to that old-school campaign look. 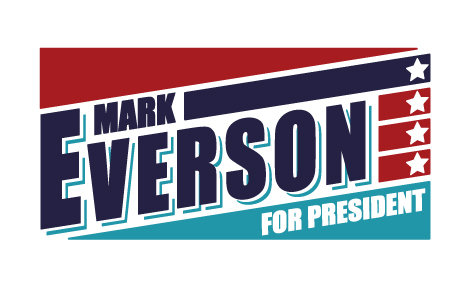 Negatives: The fonts disagree violently with each other and Everson is too thin and poorly outlined, the geometrics are cluttered and the lines don’t line up anywhere! All rookie mistakes in Illustrator, no doubt. All relatively easy to fix. Look, we already did! First things first: One typeface is all you need. We chose Impact as it’s thick, condensed and fits the space phenomenally well. Notice how all the the text flows together rather than crying out seperately for attention. The blue stripe continues the top bar of the E in Everson, bridged by Mark. The stars previously jumbled inside it have been spaced evenly down the right side and appropriately skewed with the rest of the design. The red stripes have been thickened and reduced to three, yet the overall design retains the four star, four stripe theme that may or may not have been the intent in the original. Overall, the stripe geometric now looks less like a gun pointed at the candidate and more like decoration. For President now flows with the design instead of fighting against it. We couldn’t decide if that red field at the top was too barren, so we made two versions, one with the date but you could put any old thing in there. Use one, the other, or both! But have that clever campaign manager call us first, OK! Ain’t no such thing as a free brand!